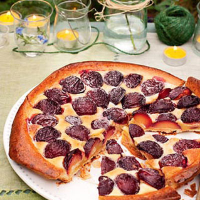 Maggie Beer’s recipe inspired by French fruit tarts. Make a glaze by beating the egg yolk, milk and a pinch of salt together with a fork; set aside. For the pastry, pulse the butter, flour and a pinch of salt in a food processor until it looks like breadcrumbs. Add the soured cream and pulse until a dough starts to form. Shape into a ball, wrap in clingfilm and chill for 20 minutes. To make the frangipane, put the butter and caster sugar in a food processor and whiz for 5–6 minutes, until light and creamy. Slowly add the eggs, one at a time, then the brandy. Mix for 1 minute, then add the flour and almonds and mix well. Scoop out into a container and set aside. Preheat the oven to 190c, gas mark 5. Remove the pastry from the fridge. Flour a work surface, roll out the pastry into a 30cm circle about 5mm thick and place it on a 23cm enamel plate or oven-proof ceramic dinner plate, then place on a baking tray. Chill for 20 minutes. Remove from the fridge, then bake on the plate for 25 minutes – the pastry will have puffed up. Carefully turn it out onto a baking sheet (use a clean tea towel to protect your hands). You will be left with an empty pastry base. Spread the frangipane over the base, about 1cm thick, then top with the plum halves, cut-side down, in concentric circles. Brush the sides with egg glaze. Bake for a further 20–25 minutes, until the plums have softened. Dust with the extra caster sugar; serve with ice cream. This recipe was first published in Sun Aug 01 01:00:00 BST 2010.